Instead of running around for junk foods for snacks we can prepare healthy and tasty snacks at home. This is more hygienic than the frozen foods and bakery items available in the market. Kids will also love this because its very crispy and tasty. This is my version of potato wedges and my son loves it very much. This can also be used as starters. Peel and Cut potatoes vertically into 6 to 8 pieces. 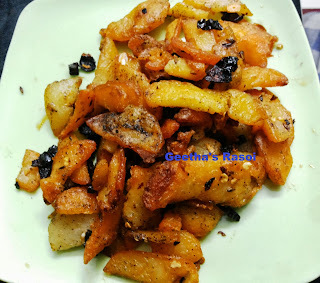 Heat oil in kadai, add pinch of jeera and chopped garlic fry till light brown, add potato pieces fry till golden brown in low flame. Sprinkle chilly flakes, pepper powder and oregano and mix it well then fry for another 2 minutes. Healthy potato wedges ready to serve.